“In planning The Transgenerational Memory of Monkeys, Uriel took a rather lateral approach to the choice of work, pulling at a very particular thread in Marcia’s work, and in a very particular way. 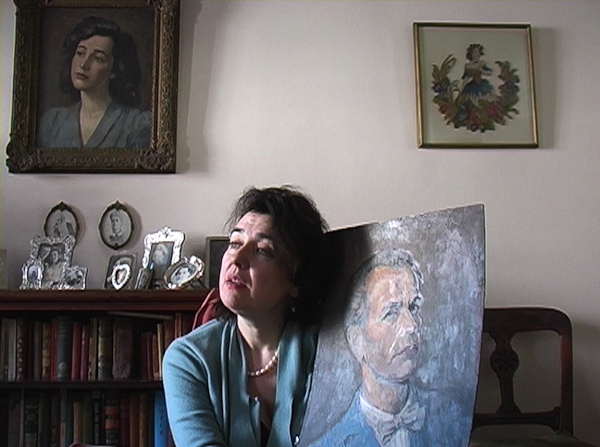 Keeping Monkey House as a motivating and framing device, the film quickly goes past that performance and, drawing forms and ideas more from other works than from Monkey House itself, into the underlying, recurring subject of Marcia’s relationship with Imre Goth. (Goth was a father figure to Marcia, an artist, inventor and family friend who died in 1982). In my recollection, Monkey House was suggested for Uriel very early on in 12 Shooters’ planning. He had an interest in Marcia’s stories of Imre, and, as is mentioned in the film, a circumstantial connection to Imre through a coincidence in his own family history. Somewhere in the discussions, though, the plan took a very satisfying turn away from Monkey House, and toward the subject of Imre’s presence and importance in Marcia’s work and life. It also took a turn toward the form of the guided tour, which itself has frequently recurred in different variations in Marcia’s work. In these tours, she is usually a guide through physical or thematic territories where she is in some way an outsider, somehow alienated, by time or circumstance, or both. They are usually places or subjects which have some intermingled personal and social history for her. As a guide, she acts with great purpose but without authority, and always with an openness to coincidence and contingency. It’s a very flexible form. Uncoincidentally, Uriel first worked with Marcia on her Walking Talking Living Yarn tour (1999), playing the pipes at a distance while she led her audiences from site to site in an area south of King’s Cross, where she had once belonged but never actually lived. The tour touched mainly on places where people she knew had lived, coloured in by a richly associative string of stories she had heard from them. This idea of discovering the presence of history in the physical environment is, to my mind, the overlapping interest most responsible for bringing The Transgenerational Memory of Monkeys to life. There is a very deep vein in Uriel’s work concerned with this often ghostly archeology of history, the recovery of memory from the physical remains of past events. In a way they are both together on very familiar ground here – the documentary of past and absent things, the search for traces of meaning in otherwise unremarkable locations, the come-what-may tour. There can be no reconnaissance for a tour such as this, though, and there’s a very particular unknowingness around the corners of this tour, which gives the performance and the film an atmosphere of both vulnerability and fearlessness.